There are almost as many fascinating ferrofluid videos on YouTube as there are clips of kittens being cute. So it's rare to come across one that offers anything new and interesting. But CrazyRussianHacker has done just that with this simple trick that turns ferrofluid into some kind of nightmarish liquid metal spinning saw blade. 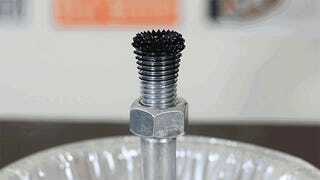 The secret here is to magnetize a large bolt stood on its end, and then gently pour a bit of ferrofluid on top of it. Gravity will pull the liquid down the bolt along its spiral thread, and the magnetic field will create those terrifying spinning spikes you see. Simple, but no less wonderful once you know how it's done.